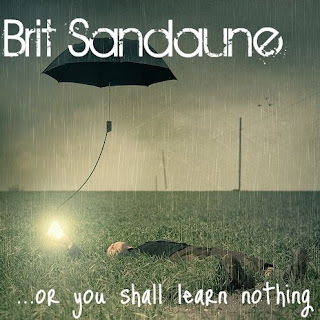 Kate had a fun game on her blog yesterday, in which you make your band's album cover! The first random Wikipedia article you get is your band name. The last four or five words of the very last quote on the page is the title of your album. 4. Use Photoshop (or something like picnik.com) to put it all together. That really looks like a real album cover. You'd buy my album, right? I was thinking the other day, what was the first CD I bought for myself? I couldn't remember for the longest time and then it came to me. Someone had given me money, possibly for a birthday and I went to the mall and bought two CDs at once. I must have been 12 because both albums came out in 1994. I remember my dad being skeptical as I said I wanted these two. He said 'you're sure, these two?' and I had to defend my choices. 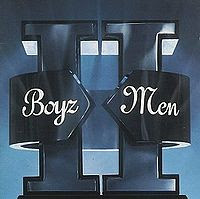 Boyz II Men's album II and All-4-One's self-titled album. What was the first CD you bought? Or tape or record, for you oldies out there. I'll have to try to cover thing, seems fun. I took a picture of my friend dave once and it looked like a album cover to we photoshopped it into a faux Jazz album soo funny. 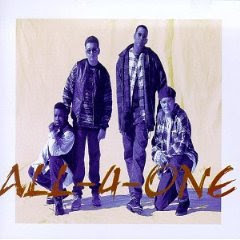 I loved all 4 one, wonder what happened to them. This makes me feel old. Mine was the Nolans, when I was a wee girl. 'I'm in the mood for dancing'. I am glad to say I no longer own it. The sound track from the first Star Wars movie, which is rather odd considering that I had not then, and haven't since, seen any of the Star Wars movies. Parlencheq - that is indeed, very odd. Scrap Girl - I love that song! Shadowfalcon - A Whole New World, classic song. God, I love that song. I shouldn't admit it, but N had the soundtrack already when I met him. HA!